Time to sell your Mustique condo? Read about today's resort-market condo buyer. Mustique condos are located in the West Beach area of Gulf Shores, Alabama. Mustique is fairly uncommon in its design as it offers great views of the Gulf of Mexico and of Little Lagoon. Mustique sits on a narrow stretch of land and is actually on the north side of Beach Boulevard, but is only a couple hundred yards from the Gulf. The condo development has deeded beach access, meaning owners and guests have their own private beach to relax on. The property also features a fishing pier with a gazebo/pavilion for gatherings with family and friends. Some of the amenities include an indoor heated pool, outdoor pool, hot tub, exercise facility, and a sauna. 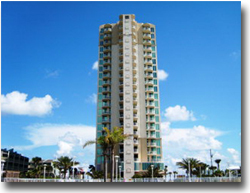 Similar Gulf Shores Lagoon Front condos include Lagoon Tower, and Bel Sole. Use our site to browse for more Gulf Shores or Orange Beach condos for sale and find helpful information including current listings, pre-defined searches, condo descriptions, and interactive maps. To schedule a private viewing, if you have questions or if you could like more info on Mustique, please email info@condoinvestment.com or call (251) Area-Pro (251-273-2776) for immediate assistance. RENTAL TIPS to increase your Mustique rental revenue.